This pizza features a surf 'n' turf stir-fry and takes the "stuffed crust" concept to its logical conclusion: creamy, luscious dessert. Pizza Hut locations outside the U.S. just keep pushing that insane pizza-construction envelope. We were so jaded after seeing sausage stuffed-crust pizza in the U.K., we thought the novelty pizza game couldn’t possibly be taken any further. 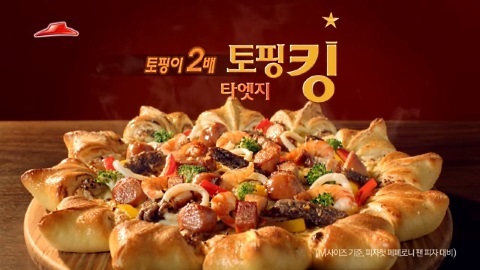 But Pizza Hut Korea just had to prove us wrong with a surf ‘n’ turf, dessert-stuffed crust pizza. Let this commercial take you on a visual tour of all the ingredients. Basically, it’s the logical conclusion of the “one dish meal” idea. One very, very large dish. We have to say, it might be one of the most aesthetically-pleasing kitchen sink novelty pizzas we’ve ever seen. Of course, we know what you actually get at fast food restaurants may not stack up to the ads, so it may not be this pretty in real life. So what does the Star Edge Pizza cost? 28,900 won ($26.96) for a medium, and 34,900 won ($32.52) for a large, according to Brand Eating. The industry magazine also helpfully provides the price of a large pepperoni pizza from Pizza Hut Korea for comparison: 19,900 won ($18.56). It’s a premium price, but not so bad when you consider that you’re getting a multi-course meal in one pizza for around $32. We say: just add some soju and have a baller night on the cheap.